The receiving, handling and answering of email has become a necessary skill in today’s market place. Most adults have at least two email addresses and around the clock dings from colleagues, clients and a multitude of businesses vying for your hard earned dollars and promising the best new widget, process, class, running shoes…or whatever. My team has spent 2 years on various email management tactics, knowing that this is a quick place of overwhelm for everyone. Including us! I used to spend HOURS answering emails, troubleshooting small problems that I didn’t get compensated for, and never crossing any actual work off my to-do list. Try out Trello and Voxer. Trello is a nifty project management software. You can create project boards and add cards with due dates. It makes getting work done a breeze! It might be better than ice cream. We use this with our team, which is ah-mazing, but even if you work alone, I promise you’ll get way more done with a list. Plus you can download the app and keep up with everything all the time everywhere. Take emails out of your inbox quickly by assigning tasks with due dates. Then file the email in the client email folder (or just archive it), knowing Trello is going to help you stay on track and get the job done. Another fun tool for us is Voxer. It’s a walkie-talkie communication phone app perfect for teams, and friends! Now when something needs to be explained, we don’t have to compose an inbox clogging email, we can just Voxer it over. If it relates to a task, then the task is posted in Trello. NO EMAILS. Yay! Do work that makes money and moves your business forward. I can say with 100% certainty that I could spend my entire work day, everyday, answering emails. If I do that, I design nothing. No projects get moved forward, because I’m spinning my wheels on small (even if meaningful) stuff. All that “stuff” will be in your inbox tomorrow morning too, and the next one. Decide how much time you can reasonably commit to these small fires, requests and newsletters, and stick to it. Maybe it’s an hour a day and you tackle 4 small things. Then you move on to your genius work and do 4 more small things tomorrow. I’ve heard lots of business coaches recommend making a list of the top 3 profitable things each day, and get those 3 things done first. Otherwise the money stops, and I don’t think any of us want that. Plus, it’s good service to my clients to stay in business, so I can help them in the future. I need to continue to design in order to make money and stay in business. So this must always come first. Get an assistant (virtual or local). I have a right hand, and she has the keys to my life. And it’s so wonderful. She manages projects and weeds through and helps control my inbox, assigning tasks in Trello as needed, doing small pieces of work, or answering clients herself as she can. This takes a GIANT sized bag of M&Ms portion of work off my plate. Now I know the things that are in my inbox are actionable items I need to deal with. I spend my free time writing (this post!) or chatting with new clients, or working with existing designs. Most likely, as the business owner, your best work is not email management. Your best work is whatever your business serves up to clients. SO DO THAT WORK. Respond only at certain times of day. There are emails I simply must answer myself. I typically run through my inbox at home, on my computer, about 3 times a day. I set aside about 15 minutes to do this, and about 15 minutes to accomplish any task coming out of that list. Any other email checking is only triage, handling things that can’t wait, or passing quick responses back to clients that I need more info on. When anyone on my team sends an email, we try to think 3 steps forward. Will this need more explanation? Then we’ve probably created a pdf and let’s go ahead and attach it (more on this in a future post). Will this need a phone call? Link is included to my calendly scheduler. This eliminates a TON of back and forth, which no one has time for…like at all. When you send an email, the subject can not be “hey!” The subject should be the topic of the email, so it’s easily searchable in the future. We also send a lot of training videos that clients want to re-watch, so we type those subject lines in ALL CAPS, so they stand out in inboxes and searches. Discuss email communication when outlining your work process. Our contract terms indicate that we function during regular business hours. Clients know that they should text me for 911 (which is typically only a down site issue), but any emailing that happens late and night or over the weekend, is a bonus for them, not the norm. We often work at night and over the weekend during a nitty gritty site launch, and customers appreciate the extra love during this stressful time, but they know it’s not standard protocol. How do you start this? You just start it. This teaches people your process and work hours. Treat people how you respond. This can take some time, but it’s worth it! You have to take your life back, and this is the first step. I think those daily roll-up subscription services are a delightful idea, but I’m still overwhelmed by the amount of stuff they have “rolled-up” into one email! It’s like every single topping at Subway, and I can’t possibly consume this sandwich. The answer here is less. Newsletters from 45 life and business coaches? Nope. Clothing stores that have a new style or sale every 15 minutes? Nope. Be critical about what gets your attention. It can’t be everything. It. Can. Not. Just like there can’t be 20 priorities. Give up every single thing you can (even if it’s me, I hope it’s not me!) and move everything into a folder that you spend 30 minutes on each Tuesday morning. So now you can stop looking at your phone every 1.2 seconds (I know, me too sometimes), checking email and getting overwhelmed. And start focusing on driving your business forward. 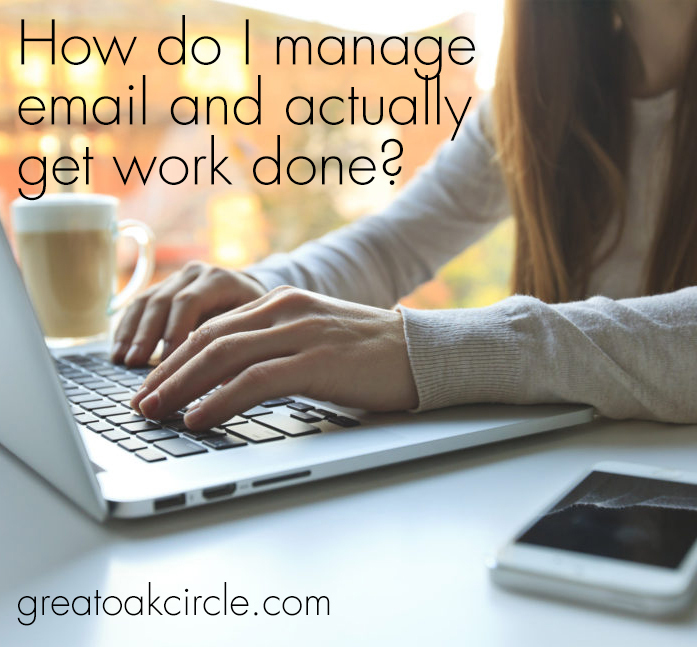 How do I keep email and social client contact organized and unoverwhelming? I’ve started using SaneBox and just absolutely love the SaneBlackHole feature. I don’t have to even see the email and don’t waste the time unsubscribing. I scan the list of 60 to 100 4 times a day. What I need to read I put in my inbox; the rest goes to the SaneBlack Hole or Archive. I’ve saved hours a week, and as it is trained, I have fewer emails to even sort through each day. I highly recommend it! SaneBlackHole put 322 annoying emails straight into my trash last week. I never even had to look at them. https://sanebox.com/t/a5adj. Try it and save us both some money. ??? ?